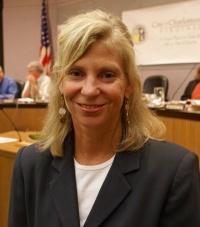 Cheri A. Lewis is a former member of the Charlottesville Planning Commission. Cheri Lewis is a managing partner with Lewis Law Offices, PLC. The following biographical information comes from a media release published by the Charlottesville Regional Chamber of Commerce upon her selection as the recipient of the Chamber’s first bi-annual ATHENA Award on February 12, 2009. "In 1994, Ms. Lewis founded a business which created a new business industry in Central Virginia and the Shenandoah Valley. When The Closing Company was founded, there were no settlement companies performing closings west of Richmond, but the company quickly grew to four offices serving 15 counties and cities in Central Virginia. Ms. Lewis managed that growth for a decade during the height of the real estate market before selling The Closing Company in 2004, when it was a Fortune 500 Company." "In 2005, Ms. Lewis left LandAmerica and took a four-month sabbatical to devote time to launching the Thomas Jefferson Community Workforce Housing Fund. The Fund provides no-interest, no-payment second lien loans to first-time homebuyers. She continues to serve as Chair of the Board of Advisors for the Housing Fund." "In 2006, Ms. Lewis opened her own law firm, Lewis Law Offices, PLC." Lewis joined the Planning Commission soon after unsuccessfully applying to the City’s Board of Architectural Review. Because Lewis is a Republican, she did not think she had a chance of being appointed to the Commission, but was encouraged to apply by then-Mayor David Toscano and Councilor Blake Caravati. Lewis stepped down when her second term expired at the end of August 2009. ↑ Jay Crawford, Director of Communications, Charlottesville Regional Chamber of Commerce, e-mail media release to Charlottesville Tomorrow, 12 Feb. 2009. ↑ Tubbs, Sean J. "City seeking two new Planning Commissioners; Lewis, Farruggio stepping downCity seeking two new Planning Commissioners; Lewis, Farruggio stepping down." Weblog post. Charlottesville Tomorrow News Center. Charlottesville Tomorrow, 25 June 2009. Web. 30 June 2009. <http://cvilletomorrow.typepad.com/charlottesville_tomorrow_/2009/06/planning_commission_vacancies.html>. This page was last edited on 29 February 2012, at 16:27.